Trump’s appointment of David M. Friedman as the new ambassador to Israel brings an end to 70 years of U.S. official policy on Palestine centered on U.N. resolutions 181, 242 and 338 with a two-state solution as the final outcome. Official policy or not, it must be made clear that, in reality, successive U.S. administrations and congressional leadership granted Israel a free hand and financed building settlements, land confiscation and permitted the structure erasure of the two-state solution. The U.S.’s official policy was a diplomatic veneer offering hope to an otherwise increasingly dismal picture in the region and providing cover for Arab allies that something is being done to “solve” the Palestine crisis. Appointment of Friedman ends the fig leaf of official policy and declares once and for all that all branches of the U.S. government stand united in total endorsement of Israel’s continued and never-ending colonization of Palestine. Trump’s administration appointments coming from the transition team on the foreign and security policy end is filled with Iraq invasion advocates and interventionist hawks, a surprising development considering the opposition to it expressed during the campaign. More importantly, the appointments are also filled with right-wing supporters of Israel’s annexation of the West Bank, expansion of settlements and movement of the U.S. embassy to Jerusalem, as well as an outright rejection of the two-state solution. Immediately after Trump’s election, former President Carter called on President Obama to recognize a Palestinian state and break the deadlock that has been in place since 2001. As expected, President Obama responded negatively while maintaining the existing official U.S. policy that rewards Israel with foreign aid, protection in the international arena and pressures the Palestinians to consent to their dispossession. Yet on another level and just as critical, let’s all in the U.S. and abroad call for Israel’s annexation and demand one person, one vote rather than allow Apartheid to masquerade as democracy. Annexation, from a settler colonial perspective, does not solve the “demographic problem” and the Israeli right-wing is still advocating for transfer to Jordan. To a sizable segment of the settlers, who are supported by Israeli government ministers and Knesset members, the idea of transfer and a Palestinian state in Jordan represent Zionism’s final solution to the “demographic problem.” Let me remind everyone that a transfer and setting up a supposed Palestinian state in Jordan does not — even if successful — end the foundational demands of the Palestinians to return to their homes and lands that were stolen and pillaged by the Zionists since 1947-48 and up to the present. More importantly, the appointment should bring to an end the delusional chapter in Palestinian political decision making and the fruitless negotiations since 1993. In reality, the PLO political mismanagement started back as early as the 1974 Arab Summit with a unilateral embrace of the two-state solution without any pre-conditions or effective framework. The promise of opening diplomatic relations with the U.S. was used as the leverage to get the PLO to collapse its existing political demands centering on the Right of Return and land rights in historical Palestine. A straight line can be traced from 1974 to the current disarray in Palestinian political decision making that lost the underpinnings of the struggle for its legitimate rights in Palestine. As the U.S. and Israel abandon the “peace process” framework, the Palestinian leadership must retrace its steps, change its course and end the foolishness of being hired hands to oversee the continued dispossession and occupation of its own people. The first step, which is already too late, is to bring unity and purpose for the Palestinian body politic. Divisions at this point in Palestinian history is criminal and all efforts should be directed at ending the existing fragmentation. Fighting over a sinking boat is the definition of insanity itself. Let’s be clear that the façade of arriving at an independent Palestinian state under the current brutal and systematic Zionist settler colonial project must be brought to an end. 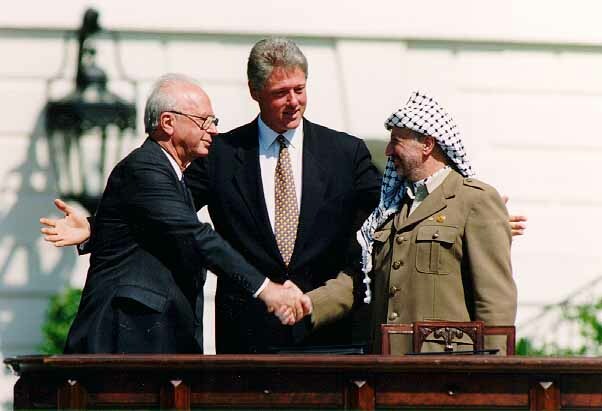 The peace process was killed by Israel many times over, and Netanyahu himself was the rhetorical gun that motivated settlers to bring it to end with the assassination of Rabin on November 4, 1995. The Palestinian Authority has reached the end of the road in the useless Oslo framework, and should immediately halt all cooperation with Israel and begin the long road to rebuild the damaged local and transnational Palestinian institutions. Here, it is important to recall that Oslo not only created the Palestinian Authority inside the Occupied Territory but also called for pulling back PLO transnationally, which meant Palestinians lost the most powerful network that was forged under the most extreme conditions. Reversing this calamitous Oslo outcome is of utmost urgency so as to benefit from the overwhelming strength of Palestinians the world over. As such, an immediate establishment of a representative Palestinian Parliament in exile should take place that will bring the strength of all Palestinians to bear in the coming and critical period. If threats of cutting aid and salaries are made, then so be it since our struggle was ill served once our political leadership became effectively employees of the Israeli government and contractually funded by successive U.S. administration. Land rights, rights of return, freedom, liberation, dignity, rights to Jerusalem and justice are priceless, and no American or Israeli government can ever purchase these from the collective body of the Palestinian people. If annexation and the move of the embassy are the order of the day for Trump’s administration, then Palestinians should make it clear that they are no longer bound by the Oslo framework, and that the basis of their claims are set back to the 1947 period. Why should Palestinians continue to hold onto a framework that Israel and its main ally, the U.S., are clearly abandoning, effectively erasing Palestine from the map anew? Forging a greater Israel by swallowing the West Bank and already the Golan Heights means that historical Palestine is the Palestinians’ rightful claim and the only starting point.